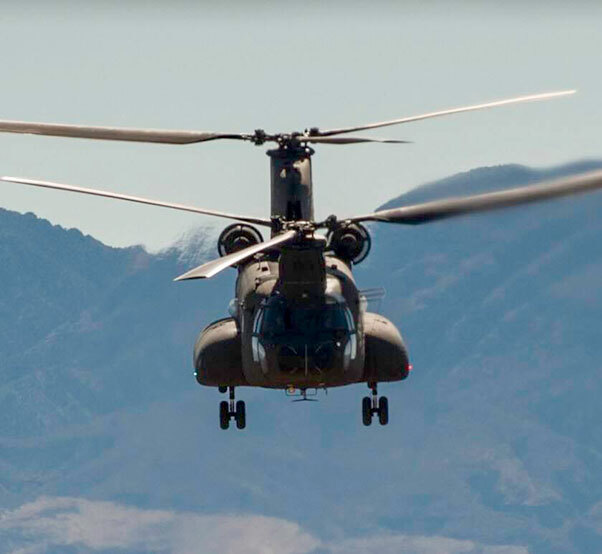 A Singapore air force CH-47 Chinook flies over the Nevada Test and Training Range, during a Red Flag 17-2 combat search and rescue mission, March 6, 2017. In performing these missions and working with coalition partners, Red Flag allows the members of the Singapore air force to extend their skill set. As the Singapore CH-47 Chinook’s twin rotors build speed and spin in unison, a loud but calming hum fills the interior of the helicopter. Seven Survival, Evasion, Resistance and Escape (SERE) specialists sit with their gear in front of them, parachutes on their backs. 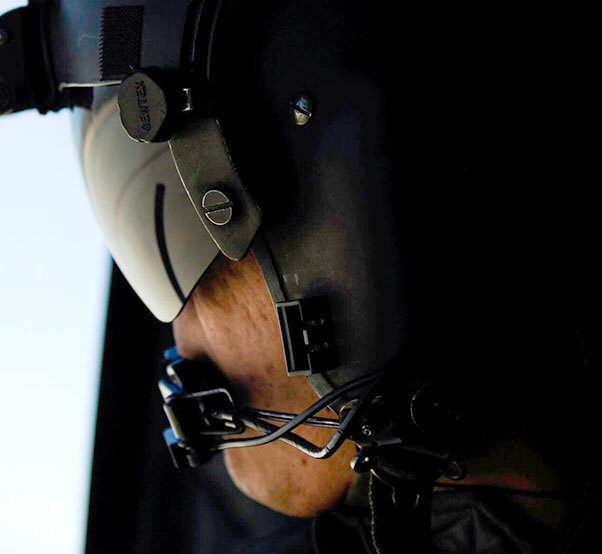 A Singapore air force crew chief looks out the window of a CH-47 Chinook during a Red Flag 17-2 combat search and rescue mission over the Nevada Test and Training Range, March 6, 2017. 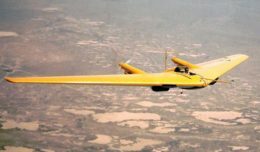 For 20 years in Grand Prairie, Texas, the Singapore air force has worked in unison with its pilots, air crews and the United States Army. Mission planning begins the day prior in the Red Flag building, and when you take into account the maintenance and operations side it becomes a very lengthy and through process, said Epperson. A Survival, Evasion, Resistance, and Escape (SERE) specialist, sits on a CH-47 Chinook before performing a static-line jump over the Nevada Test and Training Range, during Red Flag 17-2, March 7, 2017. A static line is a fixed cord attached to a large, stable object and is used to open parachutes automatically. Survival, Evasion, Resistance, and Escape (SERE) specialists sit on a CH-47 Chinook before a static-line jump during Red Flag 17-2 over the Nevada Test and Training Range, Nev., March 7, 2017. Red Flag missions are conducted on the 2.9 million acre Nevada Test and Training Range with 1,900 possible targets, realistic threat systems and opposing enemy forces. 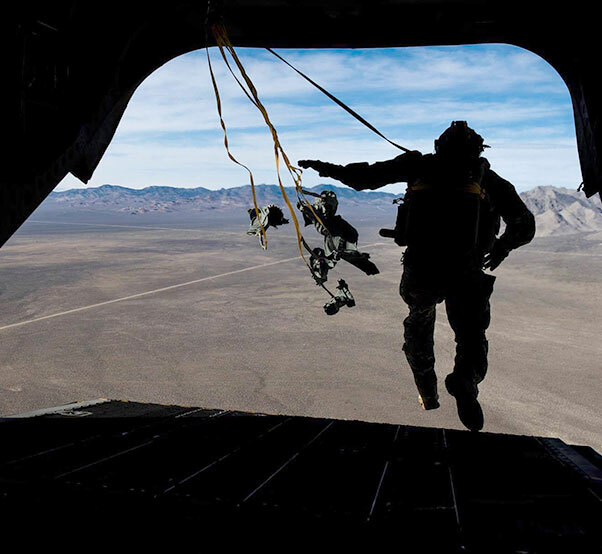 A Survival, Evasion, Resistance, and Escape specialist performs a static line jump out of a CH-47 Chinook during a Red Flag 17-2 mission over the Nevada Test and Training Range, March 7, 2017. Red Flag provides vital training and real world scenarios that progress Singapore Air Force air crews to the next level in their skills. 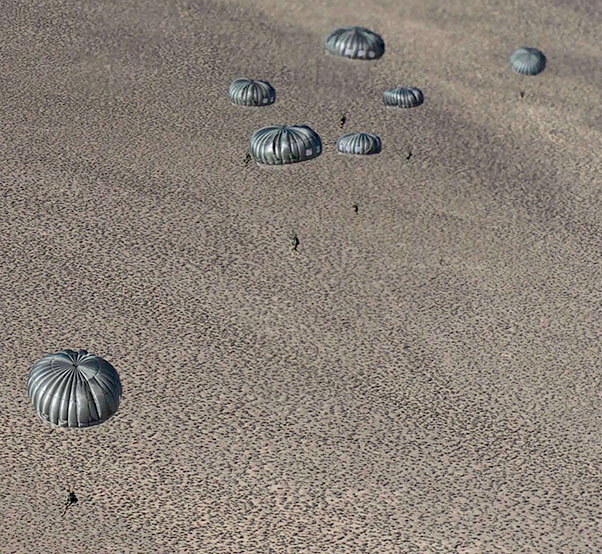 Survival, Evasion, Resistance, and Escape (SERE) specialists parachute to the ground over the Nevada Test and Training Range, during a Red Flag 17-2 mission, March 7, 2017. 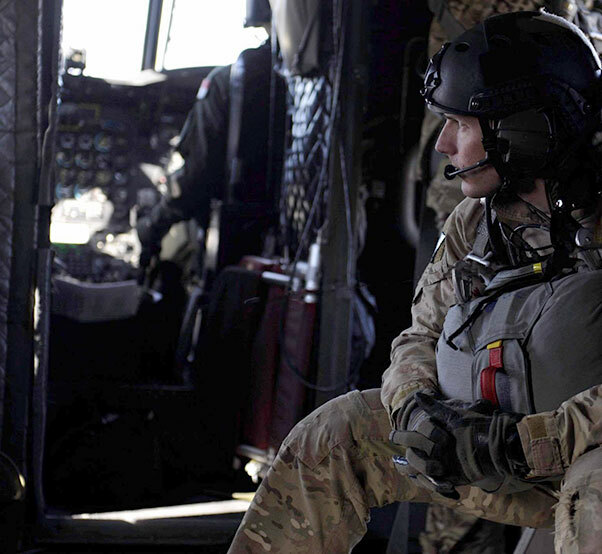 SERE specialists build foreign partner relationships, preparing the environment for potential future isolation and enabling flexible recovery options even in the absence of significant American military presence. 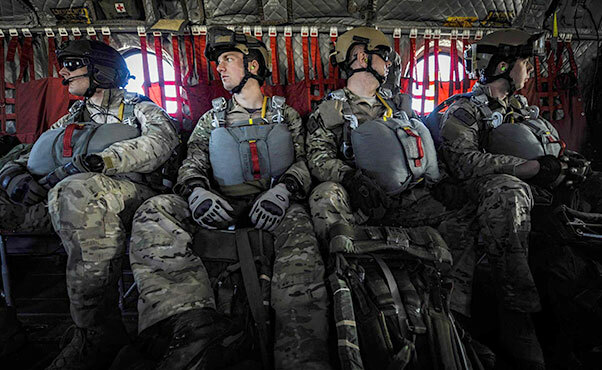 Survival, Evasion, Resistance, and Escape specialists wait to jump out of a CH-47 Chinook over the Nevada Test and Training Range, during Red Flag 17-2, March 7, 2017. Red Flag provides combat training in a degraded and operationally limited environment making the training missions as realistic as possible. 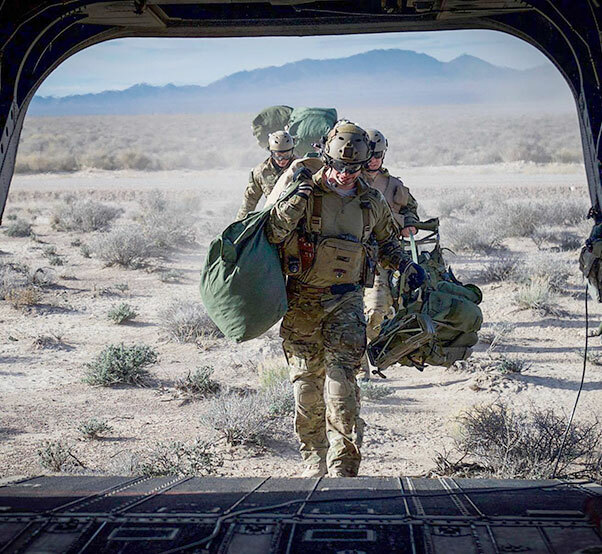 Survival, Evasion, Resistance, and Escape (SERE) specialist are picked up by a CH-47 Chinook after performing static-line jumps on the Nevada Test and Training Range, during Red Flag 17-2, March 7, 2017. 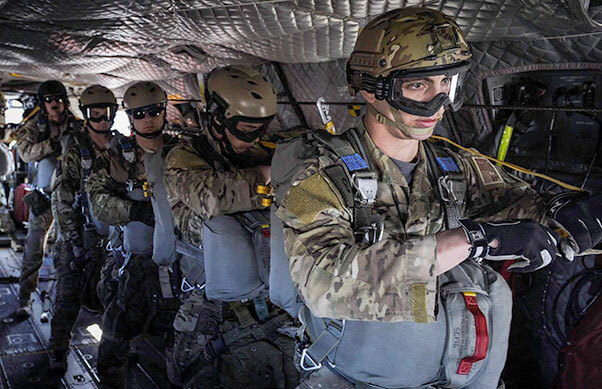 SERE specialists lead the Air Force emergency parachuting program and conduct extensive testing of parachuting systems. They are uniquely suited to analyze the operating environment to plan for evasion, captivity, and recovery considerations. 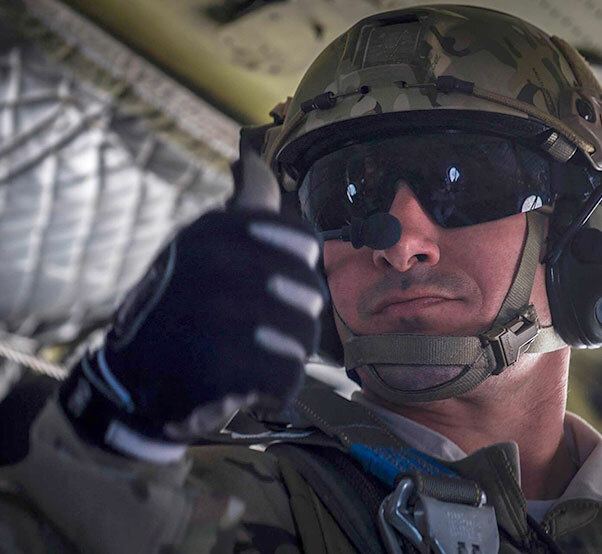 A Survival, Evasion, Resistance, and Escape specialist gives the thumbs up before performing a static-line jump during Red Flag 17-2 over the Nevada Test and Training Range, March 7, 2017. Search and rescue operations during Red Flag improve efficiency and readiness for future real world operations.